Buy a model Skeleton Set today for your anatomy or biology classroom and promote hands-on and up-close learning for students. Our Skeleton Sets feature genuine bones and provide students with an anatomically accurate, natural, view of an animal's body structure. We offer a wide range of species, including birds, frogs, fish, snakes, mammals and more. These are high quality pieces. Great for display and teaching purposes. 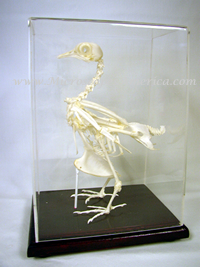 Our Skeleton Specimens are real animal bones, cleaned and specially treated. This skeleton is one of the most popular for classroom use. Teachers use it as an aid when dissecting frogs or toads. Students loves it. Great for display and teaching purposes. Our Skeleton Specimens are real animal bones, cleaned and specially treated. • The display case measures 5" x 5" x 2 3/4"
• The display case measures 8 7/8"x 6 1/4"x 5"
• The display case measures 13 3/4" x 7 3/4" x 4 1/8"